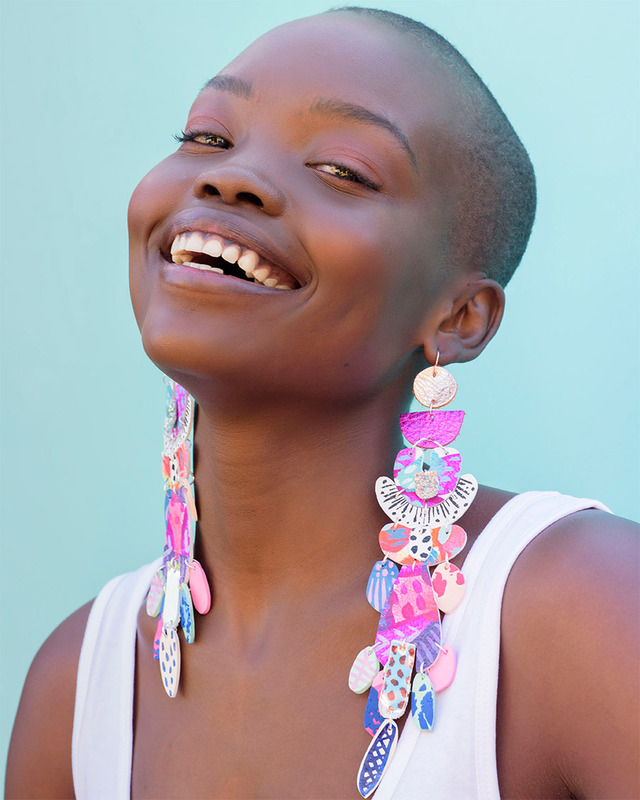 Oceanic Rave Earrings – designed and individually handcrafted by Mazdevallia. Image credit photographer, Heather Lighton, Model, Flavia Lazarus and Make up artist, Josie Hanuska. Mazdevallia is the work of artist and jewellery maker Maylin Evanochko. 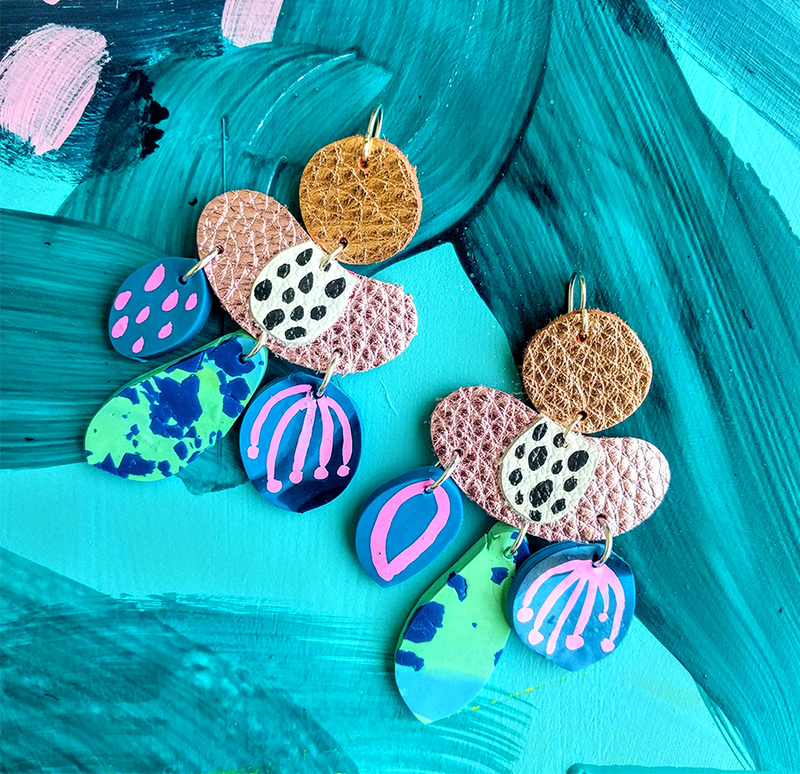 Originally a painter of large scale abstract works, in 2017 she began making jewellery in her Melbourne-based studio. Meticulously handcrafted components are assembled into eclectic earrings, each pair considered a miniature work of art. I have been passionate about painting and creating things for as long as I can remember. I moved to Melbourne in 2010 to study fine art at the VCA and was mainly into large-scale abstract painting but when I had my son in 2017, a limitation of space got me experimenting with materials on a smaller, wearable scale. Mazdevallia started out with a few experimental pieces I made for the pure joy of it in our dining room and it has grown from there. I have always been such a fan of the Finders Keepers market and I’m in awe of the creativity on display, so I am thrilled to be a part of the community! 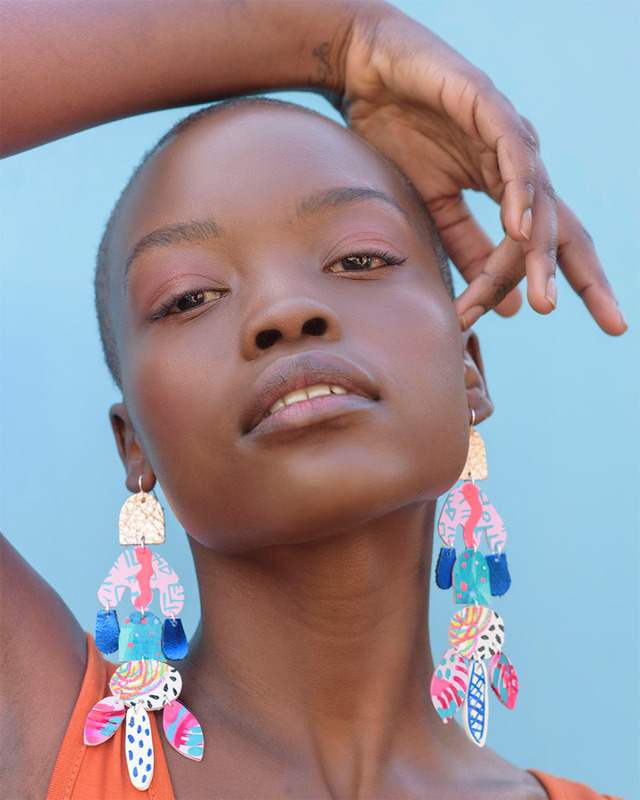 Heliconia Earrings – designed and individually handcrafted by Mazdevallia. Image credit photographer, Heather Lighton, Model, Flavia Lazarus and Make up artist, Josie Hanuska. At the moment I split my time between Mazdevallia, another job and my young family so I like to think of it all as quite a highly choreographed ‘creative ballet’! I work from home when I’m creating for Mazdevallia and usually start my studio sessions with checking online orders and social media. As I handcraft over 150 unique components for the styles I currently make, I do a lot of list writing to keep track of the production process and I plan my time carefully to allow for multiple layers of paint and different drying times. When I can I love to play around with new ideas and often have a few experiments on the go. I’m also lucky to have the help of my wonderful partner and studio assistant so we’ve had a lot of fun whilst doing all the little jobs involved in running a small business. I continue to be inspired by the amazing women creating independently in Australia who have those unique, instantly recognisable visual aesthetics such as Rene Skelton from Concrete Jellyfish, Cassie Byrnes and Tiff Mannuell. I also adore the work of David Hockney and his exhibition of paintings at the NGV in 2016 was just extraordinary, his use of colour had quite an effect on me. 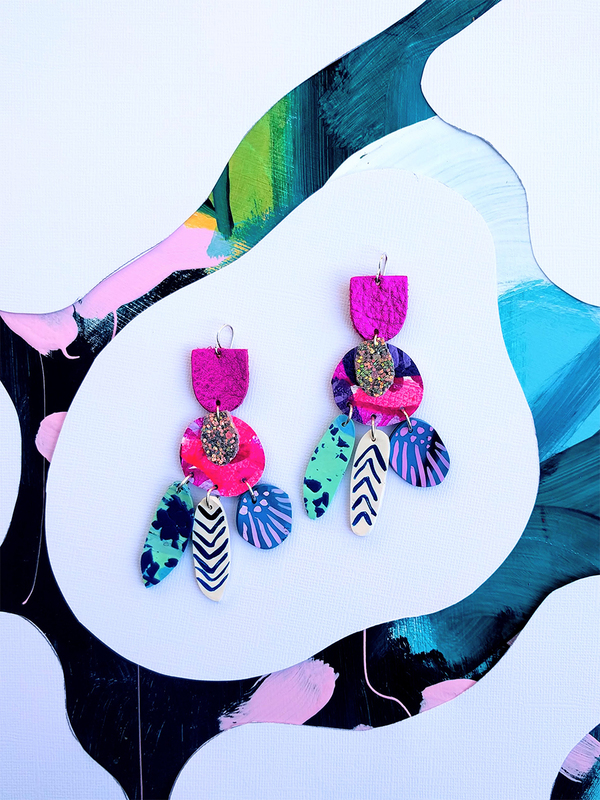 Kaleidoscope Jungle Earrings – designed and individually handcrafted by Mazdevallia. Image credit photographer, Heather Lighton, Model, Flavia Lazarus and Make up artist, Josie Hanuska. I think my background in Science and Engineering plays a big part in my creative process. It’s very experimental and I’m always looking for ways to push the boundaries of what a material can do. I’ve had a lot of amusing conversations in art supplies stores about using materials in peculiar ways, which usually ends up with both me and the store assistant on Google and them asking me to come back to tell them how the experiment went! At the moment I’m currently taking a lot of inspiration from the wonderful world of plants and the name ‘Mazdevallia’ is a riff on the name for a species of orchid. I am super excited to check out Magpie Goose at the upcoming Finders Keepers in Melbourne and their amazing patterns (right up my alley!) 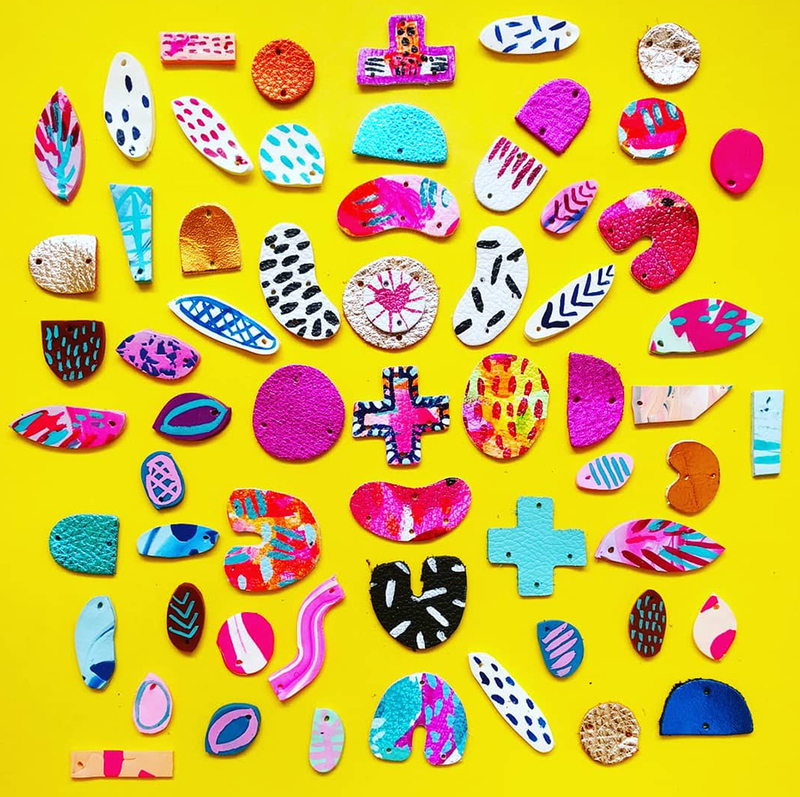 and so many other incredible designers – too many to list! My proudest moment to date is really hard to single out but I have been touched by all the messages I’ve received from people who have taken the time to let me know how much they appreciate these colourful creations, seeing them appear on T.V and featured on Etsy international.